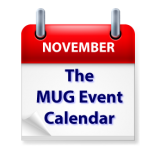 Photos and operating systems seem to be the hot ticket on this week’s MUG Event Calendar. Jason Snell will talk about Apple’s new Photos app at an Illinois group, while expert photographer Judy Morse and Photoshop instructor Lesa Snider will team to talk digital photography at a Virginia group. El Capitan, the latest version of the Mac OS, will be the scheduled main topic in Australia, Colorado, Ohio and California, with iOS a close second at two other groups.